← Not just the railways…. With a few days to go to the 25th, it’s time for a Christmas Health and Safety reminder. 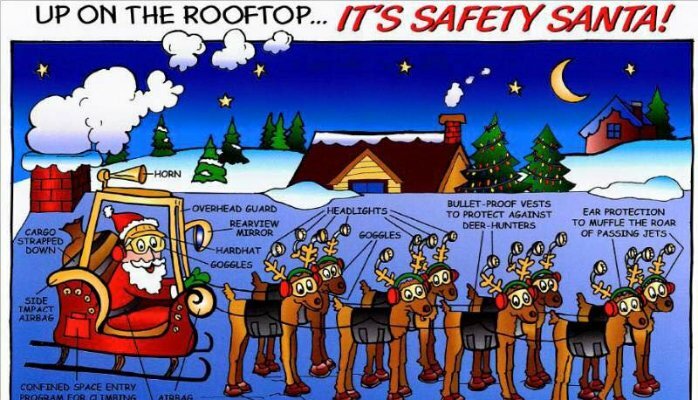 You will be please to hear that the HSE has posted the ’12 Myths of Christmas’. HSE from media reports and correspondence received. Myth: Workers are banned from putting up Christmas decorations in the office. Strange that – I though it would be more dangerous not being able to count up to 12? However, take note of this warning from the USA…. MCEVERS: It happened two years ago. He was putting some finishing touches on the extravaganza when he saw it – an off-kilter candy cane on the edge of his roof. He was in a rush to get to work, but he had to fix it. Kurt Farmer took one bad step and fell from his roof to the concrete below. FARMER: I shattered my pelvis. Somehow I came down 15 feet and landed literally on my right leg – shattered that into 32 pieces and then collapsed and landed on my rotator cuff and shattered that. SIEGEL: It took several surgeries and nine months of rehab to recover. The next Christmas, he was back at it with the lights and the inflatables. MCEVERS: Farmer says he’s in pain every day. He has found ways to make decorating easier, though, like using a mechanical lift. FARMER: I added another 10,000 lights on my tree this year because I could go so much higher. I had never been that high before because I was doing everything off a ladder. SIEGEL: He’s also more careful, he says, and more deliberate when he puts up his decorations. One holiday in the hospital was enough. FARMER: Take your time. And patience is always a virtue because it’s not worth what might happen to take the extra 30 seconds to do it the right way. MCEVERS: Good advice from Kurt Farmer, extreme Christmas decorator of Alexandria, Va. Absolutely no comment! But the following from UK hospitals are more likely…. Hospitals reported 4 broken arms last year after cracker pulling accidents. Three people die each year testing if a 9v battery works on their tongue. Five people were injured last year in accidents involving out of control Scalextric cars. Eight people cracked their skull in 1997 after falling asleep while throwing up into the toilet. Eighteen people had serious burns in 1998 trying on a new jumper with a lit cigarette in their mouth. 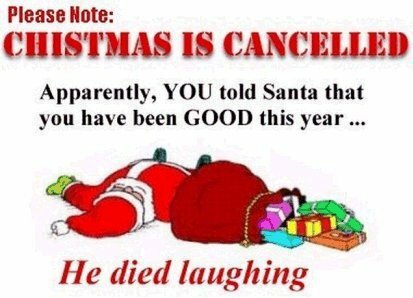 Nineteen people have died in the last 3 years believing that Christmas decorations were chocolate. Thirty one people have died since 1996 by watering their Christmas tree while the fairy lights were plugged in. One hundred and one people since 1997 have had to have broken parts of plastic toys pulled out of the soles of their feet. One hundred and forty two people were injured in 1998 by not removing all pins from new shirts. Five hundred and forty three people were admitted to A&E in the last two years after opening bottles of beer with their teeth. This entry was posted in Inspiration, Out and about, Prototype, Weird and wonderful and tagged Christmas, humour, inspiration, travel. Bookmark the permalink. 1 Response to Christmas public service anouncement…..